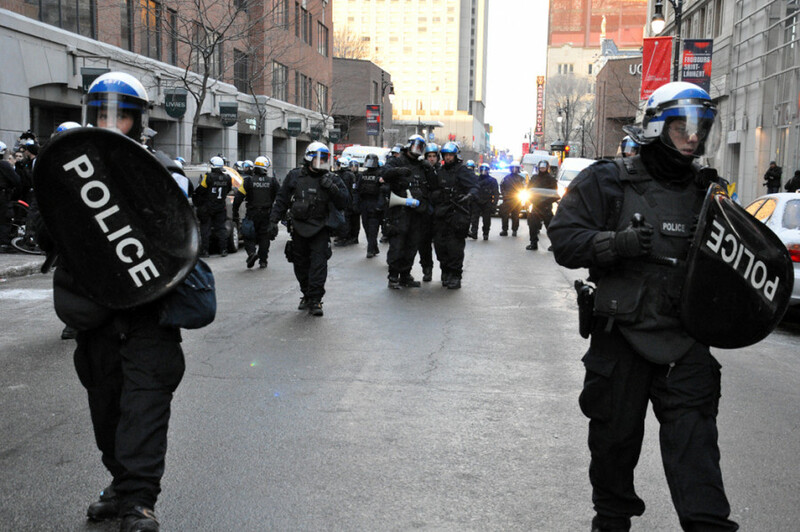 Read more on the history of police and protests in Montreal. At first, it seemed like things were over before they had even started. A few hundred protesters gathered at the corner of Ontario St. and St. Urbain St., just north of the Service de police de la Ville de Montréal headquarters to protest against police brutality. The annual demonstration, now in it’s 17th consecutive year, started somewhat unusually, with the SPVM blocking every road leading out of the corner in an attempt to halt the march from beginning. The demonstration was declared illegal almost immediately after its start around 5 p.m., due to organizers failing to provide an itinerary for the demonstration. Arrests began when the crowd had yet to leave the square, resulting in a brief brawl and at least one injured protester. As the police unblocked St. Urbain St., the crowd marched south but were forced to disperse into various groups—before making it one block down the road. A few firecrackers were lit by protesters but the crowd was less violent than in previous years, when marches had quickly devolved into riots. Different crowds throughout downtown were kettled, stopping the hundreds of protesters from ever regrouping. Police were reluctant to let any one out of the blockades. For the next three hours the fractured demonstrations were broken up by SPVM officers blocking multiple street corners, forcing protesters into smaller groups, where they were then kettled and arrested. Some protesters were released, though those who were not were identified and brought into busses to be taken to an undisclosed location. 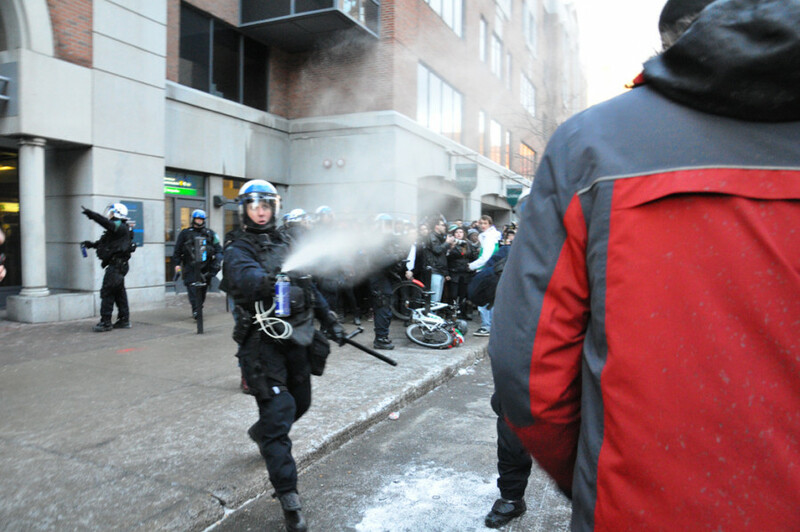 Because of the immediate kettling, there was significantly less damage sustained than last year, when multiple store and car windows were smashed throughout the downtown core. During one larger kettle, one injured SPVM officer was put into an ambulance on a stretcher, which elicited some cheers from the crowd. Many protesters were injured before, or during arrest, but as of now it is unknown as to how many injuries were sustained. Last year’s demonstration saw 226 arrests. At press time, the Montreal police have announced more than 250 arrests took place Friday—most falling under article P-6, which bans the wearing of masks and requires protest organizers to provide the route of the demonstration. Find more pictures from the protest in our photo blog.